NOTICE: Activation key must be used on a valid Steam account. Requires internet connection. SPECIAL OFFERAvailable as digital bonus: official Soundtrack, Concept Art & an Art Book for Deponia Doomsday! About the game Can you change Deponia's fate? Do you have what it takes to change Rufus' past, present and future without accidently destroying the whole planet? Fight time itself in this action-pac… ked, platypus-tastic and insanely hilarious story. One fateful night, Rufus awakes from a haunting nightmare: he sacrificed himself to save Deponia. But at what price? Elysium, the floating city crash-landed on the planet. As the last surviving Deponian, he fought savage fewlocks, but in the end, there was only one way out: He had to blow up Deponia! And... He grew a mustache. Of course he realized that these gruesome events -especially the mustache part- had to be prevented from ever happening. Deponia and his well-shaved face had to survive!But was this really just a dream? With the help of McChronicle, a quirky temporal scientist, who discovered strange time-anomalies, Rufus discovers that some time travelers from the future carelessly parked their time machine in his neighborhood. Just imagine if this amazing technology would fall into the wrong hands! Dive right into this frantic sequel of the Deponia cult-trilogy and join the chaotic anti-hero Rufus on his most peculiar adventure. Even without knowing the previous installment, the hilarity of Deponia Doomsday will have you cracking smiles and burst with laughter. Get enthralled by the bizarre humor and the uniquely designed world and enjoy the largest and longest Deponia adventure of all time. KEY FEATURES	A new installment of the award-winning Deponia Series Epic adventure gameplay	Unique hand-drawn comic style	Familiar faces and more than 70 new crazy characters featuring the whacky humor you love so much	Turn back time and see a new spin on the junk-planet's history	Platypus-tastic action	Junk meets decadence: playable levels on Deponia and Elysium	Discover the lush flora and fauna of Deponia System Requirements Windows - Minimum OS Version: Windows Vista SP1 Processor: 2 GHz Dual Core CPU Memory: 2 GB RAM Graphics: ATI Radeon HD 3400 Series, Geforce 9400 Series with at least 512 MB VRAM DirectX Version: 9.0c Disk Space: 3200 MB available disk space Sound Card: DirectX 9.0c compatible sound card with latest drivers	Windows - Recommended OS Version: Win 7, 8, 10 Processor: 2.6 GHz Dual Core CPU Memory: 3 GB RAM Graphics: ATI Radeon HD 4500 Series, Geforce 9400 GT or higher DirectX Version: 9.0c Disk Space: 3200 MB available disk space Sound Card: DirectX 9.0c compatible sound card with latest drivers Mac - Minimum OS Version: Mac OSX 10.7 Processor: Intel 2 GHz Dual Core CPU Memory: 2 GB RAM Graphics: ATI Radeon HD 4850 Series, Geforce 130 Series with at least 512 MB VRAM Disk Space: 3200 MB available disk space Sound Card: 16 bit Mac - Recommended OS Version: Mac OSX 10.11 Processor: Intel 2.7 GHz Dual Core CPU Memory: 4 GB RAM Graphics: ATI Radeon HD 6970 Series, Geforce 640M GT or higher Disk Space: 3200 MB available disk space Sound Card: 16 bit	Linux + Steam OS - Minimum OS Version: Ubuntu 12.04 (64 Bit only) Processor: 2 GHz Dual Core CPU Memory: 2 GB RAM Graphics: Geforce 9400 Series, ATI Radeon HD 4500 Series with at least 512 MB VRAM and proprietary drivers, latest OpenGL driver Disk Space: 3200 MB available disk space Sound Card: Sound Card with latest drivers Linux + Steam OS - Recommended OS Version: Ubuntu 14.04 (64 Bit only) Processor: 2.6 GHz Dual Core CPU Memory: 3 GB RAM Graphics: ATI Radeon HD 5600 Series, Geforce 9400 GT or better with proprietary drivers Disk Space: 3200 MB available disk space Sound Card: Sound Card with latest drivers © Copyright 2016 Daedalic Entertainment GmbH. 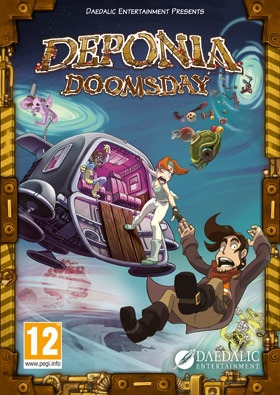 Deponia, Deponia Dooomsday and their respective logos are trademarks of Daedalic Entertainment GmbH. Daedalic and the Daedalic logo are trademarks of Daedalic Entertainment GmbH.